According to the United States Dietary Guidelines for Americans, half of all grains consumed should be whole grains. These include foods made from whole wheat, oats, barley, cornmeal and brown rice. White rice – like foods made with white flour – is considered a refined grain. That means that swapping out your white rice for brown rice is an excellent way to up your whole grain consumption. White rice is simply brown rice that's had it's covering, called the hull, removed. White rice cooks faster and has a fluffier texture than brown rice, so it tends to be more popular. But when the hull is removed, a lot of the fiber goes with it. A cup of brown rice has 3 1/2 grams of fiber while white rice has less than one gram of fiber. We all need from 28 to 35 grams of fiber in our diet every day so that those extra grams can make quite a difference. Brown rice fiber is good for your digestive system and it helps slow down the absorption of the white starchy part. Research studies have shown that eating a high-fiber diet is also useful for managing cholesterol and reducing the risk of heart disease. That's not unique to brown rice fiber—it also includes all sources of whole grain fiber. 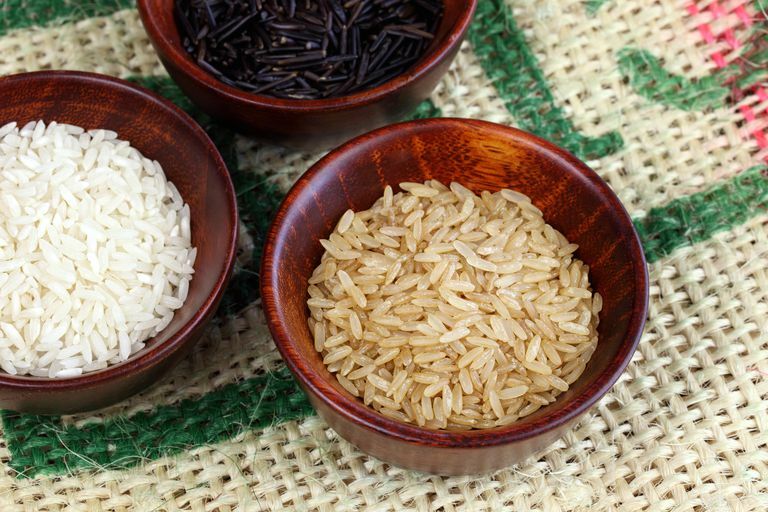 Brown rice maintains magnesium, manganese, and zinc, which are all lost when the rice is refined. But while white rice has lost those minerals, yet it's often fortified with iron and some B vitamins. That's a good thing, but the white rice is still missing the fiber. Some people love the chewier texture and stronger flavor of brown rice. That makes it easy—just buy brown rice instead of white. But for some, it takes a little while to get used to the difference. In that case, experiment with different side dishes and pilafs—brown rice can be blended with other cereal grains like wild rice or quinoa. Brown rice is easy to prepare, just like white rice, but it takes longer to cook. Serve brown rice as a side dish or use it as an ingredient in a pilaf, salad, or another dish. And look for recipes that don't call for lots of butter or margarine and be careful with casserole recipes—they're high in fat and sodium when they're made with cheese and creamy sauces. If you were wondering, I like to make my own brown rice with vegetable broth rather than water and add mushrooms and almond slivers. Sometimes, I even combine quinoa and brown rice and cook them at the same time. Brown rice can also be mixed with cooked peas and carrots or peppers and onion. Delicious! Cho SS, Qi L, Fahey GC Jr, Klurfeld DM. "Consumption of cereal fiber, mixtures of whole grains and bran, and whole grains and risk reduction in type 2 diabetes, obesity, and cardiovascular disease." Am J Clin Nutr. 2013 Aug;98(2):594-619. The United States Department of Agriculture Agricultural Research Service National Nutrient Database for Standard Reference Release 28. "Basic Report: 20037, Rice, Brown, Long-Grain, Cooked." The United States Departments of Agriculture and Health and Human Services. "Dietary Guidelines for Americans 2015-2020."